Where in the world do I start with this book? 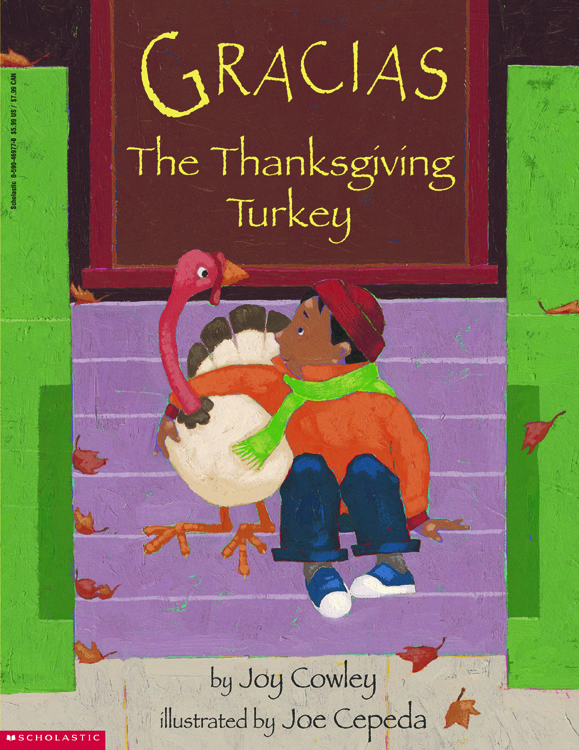 The Latina in me loves the fact that this holiday tale is about a Puerto Rican family living in a bustling, close-knit burrow in New York City, but the animal advocate is frustrated at the blustering disconnects within the text. Housing. Gracias moves from a cage in the backyard to the bathroom after being stolen from the stoop. Sustenance. Grass clippings from Central Park and leftover lettuce and cabbage from the local bodega keep Gracias full. Exercise. In order to take Gracias for a walk, Abuelo makes a leash of sorts with a cord tied to a ring around Gracias’ foot. “When she gets too big for your oven, give her to me,” said Officer Deveraux. What reconciles the tale for me personally is a scene in the church. Abuela forgot to put Gracias back in the house and the turkey follows the family to mass. 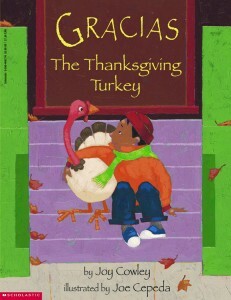 Miguel apologizes to the priest, but Padre Jaime simply smiles and declares, “God made small boys and God made turkeys. Stand still while I give you both a blessing.” The family concedes that they cannot eat a blessed animal and in turn decide on chicken for dinner and a petting zoo home for Gracias. The last image of the book shows Miguel and his father feeding Gracias in his new residence.